Publishing modern open access journals online doesn’t have to be technical or time-consuming. With Scholastica’s customizable journal website template, it’s possible to create engaging journal websites in a matter of minutes. Publishers can update their journal websites using a simple editor tool—and they can even add custom website pages. Adding a custom page to Scholastica’s journal website template is easy, and it’s free! Whether you’re currently using Scholastica’s publishing platform or you’re considering it, you likely have some questions about how custom website pages work. In this post, we’re going to take you through when you should add a custom page to your journal website (and when you shouldn’t), some examples of effective custom journal website pages, and how to add a custom page to Scholastica’s journal website template. The first principle of good website design is to keep it simple. An extra page should only be added to your journal website if it will provide obvious and lasting value to visitors. Otherwise, you’re just giving visitors more pages to click through to find the information they need. At Scholastica, we consider all journal websites and their navigation bars sacred. Yes, sacred. So we work with every journal interested in adding a custom page to their website to help them determine if an extra page is needed or if they’d be better off adding additional information to an existing page. We’ve designed Scholastica’s journal website template to include the following core journal pages: About, For Authors, Editorial Board, Articles, and Issues. For most journals, these core pages should be just what they need. But sometimes, journals do have specific circumstances that warrant adding a custom website page. We recommend that publishers not add custom pages to their websites for temporary announcements or information intended for authors that would be more logically found on the “For Authors” page. Now that we’ve gone over a few dos and don’ts for custom page creation let’s take a look at some examples of journals successfully using custom pages. Every journal is different and many have particular website needs. Custom pages can help journals house important information that doesn’t fit into one of Scholastica’s core journal website template pages. For example, if your journal is affiliated with an annual conference or symposium that you want readers to know about, or if your journal has detailed open access publishing policies that won’t easily fit on your For Authors page, you may need to add a custom page to your website. One of the most common use cases for custom pages is to add information for reviewers to your journal website. Providing basic reviewer guidelines or a reviewer checklist is a good practice to help scholars get acquainted with your journal’s peer review process before they accept a review request, and to help them know how to approach writing a review for your journal. 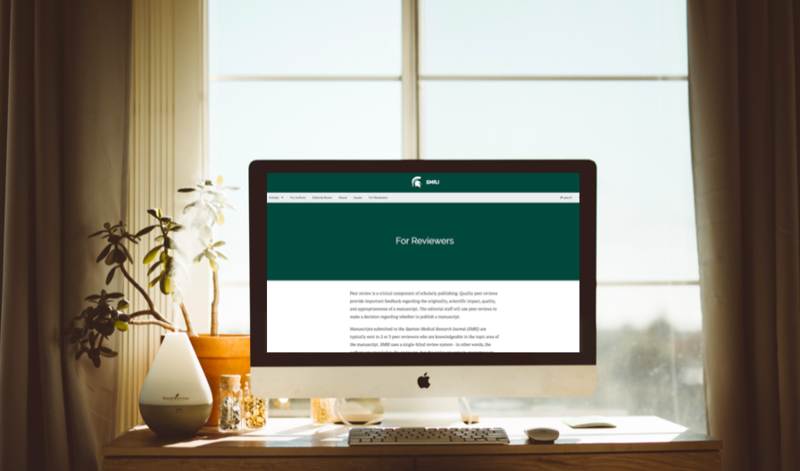 In the example pictured above, Spartan Medical Research Journal (SMRJ) has a “For Reviewers“ page on its website that overviews the journal’s peer review process. The page also includes a list of steps reviewers should take before and while compiling their reviews including contacting the editors if they suspect a conflict of interest, providing specific comments, and keeping all manuscripts confidential. This page provides SMRJ reviewers with valuable information to guide them as they write their comments. Another common way that journals use custom website pages is to add publication sponsor information. For example, a journal published by an academic association may choose to add a sponsor page to its website to provide details about the association and link to it. In the above example, Precision Nanomedicine uses a custom page to provide further details about the journal’s non-profit publisher, Andover House, as well as to acknowledge that the journal receives partial funding from and is supported by various other academic associations. It’s worth noting that in most cases, sponsorship information fits well on journals’ About Pages. In this case, because Precision Nanomedicine had such a lengthy list of sponsors, it was best for the journal to create a separate “Sponsors and Supporters” page. Finally, another way publishers use custom pages is to add subscription information to their journal websites. For example, some scholarly societies and associations publish all open access content online but still run limited print runs of new journal issues for paying subscribers. As shown above, the Houston Law Review has a “Subscriptions” page with information on its print subscription costs as well as payment options, including an embedded PayPal form. The journal also includes a “donations” option on its subscription page with a PayPal link. If you find that your journal has the need for a custom page you can easily request to have one added to your website. Just reach out to Scholastica’s support team with the specifics of the page you’d like to add to your journal website and we’ll review your request and add the page. Once a custom page has been added to your journal website template you can easily edit it using the simple editor tool like all of the other website pages (as shown above). You’ll have the ability to customize the page banner and text and embed images, media, or forms/widgets. If you have an idea for a custom journal website page and want to discuss it further, don’t hesitate to reach out to the support team. If you’re not yet using Scholastica’s open access publishing platform and you’re interested in learning more, you can sign up for a personalized demo here. In this interview, Björn Brembs, professor of neurogenetics in the Institute of Zoology at Regensburg University and advocate for open access, discusses his thoughts on the future of academy-owned publishing. The start of a new year is always a good time for reflection. Before we dive into 2019, we wanted to take the opportunity to look back at some highlights from last year and our plans for the year ahead.